Michelangelo is recognised as one of the greatest painters and sculptors from the Italian Renaissance. The artist painted the masterpiece between 1508 and 1512 in Rome and it has since been gazed upon by thousands of worshippers and tourists alike. Ian Suk and Rafel Tamargo claim that the final panel in the awe-inspiring ceiling reveals a precise depiction of the human spinal cord and brain stem. The scientists from Johns Hopkins University School of Medicine in Baltimore, were studying the far western panel that depicts God separating light from darkness with his hands. They noticed that God's throat and chest had anatomical irregularities, which were not present in any other figure in the fresco. And while the figures are illuminated diagonally from the lower left, God's neck is illuminated straight-on. They concluded that what looks like clumsiness must have been deliberate work by the genius. 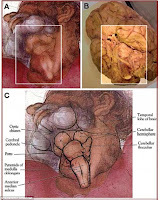 By superimposing God's odd-looking neck on the photograph of a human brain seen from below they showed the two matched precisely. 0 Response for the "Michelangelo's Code Is Broken By Experts"